The air was cool off the lake, and I was glad for my sweatshirt. Growing up in Texas, I was still surprised by how chilly the summer nights were up in the mountains! Glancing down the bench I smiled to see my campers holding hands while we sung together around the campfire. I don’t remember what song we were singing, but I do remember the complete abandon evident in the faces circled around the flickering fire. A few campers had their eyes closed, and more than a few of us counselors were enjoying a peaceful moment while voices raised in song filled the air around us before drifting into the pine trees at our backs. As the last pure and wondrously imperfect note faded into the stillness, I took a breath and waited for the next song to start…but it didn’t. No one spoke as the guitarists and song-leaders stood in front of us, silhouetted by leaping tongues of flame and light that reached up into a starry sky. A few seconds passed, it couldn’t have been more than 10 or so, but it seemed like an eternity. Finally, one of the song leaders spoke in what was almost a whisper. She said, “True silence is the rest of the mind; it is to the spirit what sleep is to the body, nourishment and refreshment.” She spoke those words two more times before we were silent together for another minute or so, then we sang one last song and headed up to our cabins for the night. I will never forget those words or that beautiful evening. There is so much focus in our lives on filling the spaces in-between! We fill those spaces with noisy activities, television, and yes, with music. What struck me about the quotation that the song-leader read (which later I found out is attributed to William Penn and is hundreds of years old) is how essential he makes silence seem. Silence being to the mind what sleep is to the body! Silence may seem like a kind of funny subject to blog about for a music teacher, since I earn my living making noise! However, I find that silence is an essential and underrated part of music. The contrast of sound next to silence energizes and inspires us when we listen to or make music! And it is amidst silence that for centuries musicians have been inspired to compose beloved songs, symphonies, concertos and the like. When you come to class at Heartsong, it is to make music together. But do not be afraid of silence! It holds a myriad of opportunity, rest, possibility and inspiration. We become so busy filling the spaces in-between! Remember that it is just as valid to sit quietly with your child and rest together as it is to busy ourselves with activities and whatever is next on our “to-do” list. Allow your family to experience the magic of sitting in silence together, use it as a tool to introduce the basics of introspection, looking inside our minds. Challenge your children to be quiet for very achievable amounts of time, 10 seconds, 30 seconds and then build to minutes! Ask after the silence, “What did you think about while you were quiet? Did you imagine anything?” You may be surprised by the responses that you hear! Silence is also the space in which our children develop the ability to audiate. Audiation is a fancy word for “imagining” sound. It is the foundation of musicianship and happens when we hear and understand music when the sound is not physically present. Did you get that? I’m going to repeat it because it is so darn important: Audiation is one of the most important building blocks of musical development – and it happens in SILENCE. 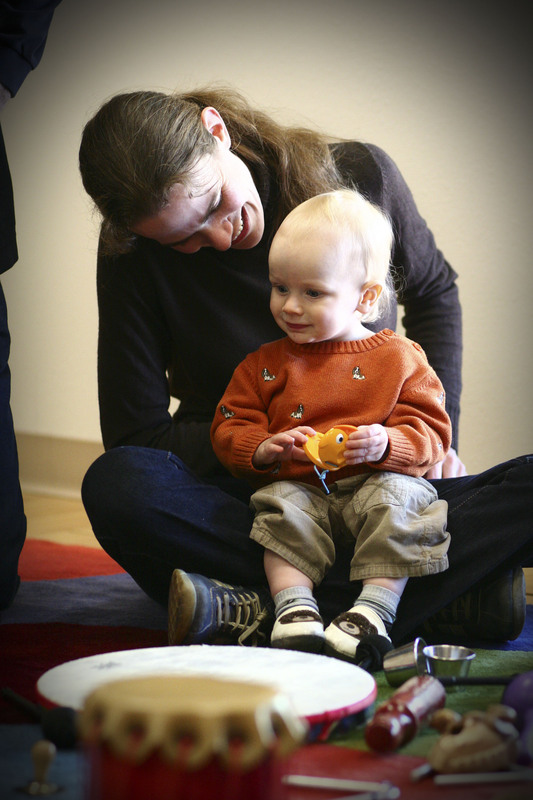 In our Music Together classes, we give opportunities for purposeful silence because the children are able to process the music they just heard without any other sound getting in the way. It is in this silence that they will begin to hear the music in their heads, which is necessary for them to do before they can effectively produce their own music. Here’s a simple exercise to try at home to give your child an opportunity to audiate: start singing a favorite song (songs that have motions to accompany it are especially great for this exercise). Then tell your child (if they are old enough), “Now we’re going to sing in our imagination instead of with our voices,” and go through the song with the motions, but without singing. If your child isn’t old enough to understand directions, go ahead and just do it without speaking the instructions. Do this several times, alternating between singing out loud and then thinking the notes in your minds. This activity is a super-vitamin for your child’s musical development, and is fun, too! Wishing you all the best until next time and happy music making!